Every year Haselden Construction hosts an amazing Lean-In retreat in Breckenridge. Because we are spread out over four different offices (Centennial, CO; Fort Collins, CO; Glenwood Springs, CO; and Laramie, WY) and numerous project sites, it’s sometimes hard to find the opportunity to meet each other, much less actually get to know one another. 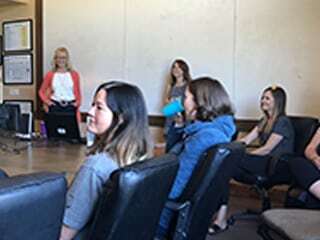 This two-and-a-half day retreat gives us the opportunity to talk to the other women in the company in an informal setting, as well as review the Lean-In Circle’s mission statement, vision statement, and 2018-2019 goals. This year we were also fortunate to have two guest speakers come present to the group: Marley Bordovsky and Linda Loflin Pettit, both from the Denver City Attorney’s Office, Prosecution and Code Enforcement. What Marley and Linda spoke to us about was a departure from our normal topics, but one that affects too many women—and men—in this country: domestic violence. According to the National Coalition for Domestic Violence (NCADV), an average of nearly 20 people per minute are physically abused by an intimate partner in the US. One in three women and one in four men have been victims of some form of physical violence by an intimate partner in their lifetime. This means that you most likely have known or will know someone touched by domestic violence. What is the best way to help a person in that situation? This handout details each step, offering ideas to help the abused person get out of the relationship. There is help available for those in a domestic violence situation. Violence Free Colorado offers safety planning, emergency shelter, counseling, legal advocacy, medical advocacy, and much more. Haselden is proud to be sponsoring the Denver District Attorney’s Office’s Third Annual Domestic Violence Symposium this October.